The book offers a high yield, combined presentation of neuroanatomical illustrations and text and provides the reader a ‘one-stop source’ for studying the intricacies of the human nervous system and its sensory organs. It includes an alphabetical list of official English terms and synonyms with the official Latin terms and synonyms from the TNA. With regard to the entries, the name of the item in standardized English is provided, followed by synonyms and the official TNA Latin term, Latin synonyms and eponyms, a short description and in many cases one or more illustrations. To facilitate the use of illustrations, certain entries such as the gyri or sulci of the cerebral cortex are presented together with extensive cross-references. Terms that form part of a certain structure (such as the amygdaloid body, the thalamus and the hypothalamus) are listed under the respective structure. Segments and branches of arteries are discussed under the main artery, for example the A1–A5 segments under the anterior cerebral artery. Most nerves can be found following their origin from the brachial, cervical and lumbosacral plexuses. However, the major nerves of the limbs are discussed separately, as are the cranial nerves. Nuclei can be found by their English name or under Nuclei by their eponym. Building on the strength of the previous two editions, Bergman's Comprehensive Encyclopedia of Human Anatomic Variation is the third installment of the classic human anatomical reference launched by Dr. Ronald Bergman. With both new and updated entries, and now illustrated in full color, the encyclopedia provides an even more comprehensive reference on human variation for anatomists, anthropologists, physicians, surgeons, medical personnel, and all students of anatomy. Developed by a team of editors with extensive records publishing on both human variation and normal human anatomy, Bergman's Comprehensive Encyclopedia of Human Anatomic Variation is the long awaited update to this classic reference. Johann Friedrich Lobstein (1736-1784) was an Strasbourg physician and anatomist. His 1760 inaugural dissertation on the spinal accessory nerve, written in Latin, is a classic. The neural anastomosis between the accessory and vagus nerves within the jugular foramen is known as Lobstein’s anastomosis. This book presents the first authentic English translation of Lobstein’s dissertation along with an introduction on the life of the author. The text is annotated throughout to make it easily comprehendible by contemporary readers. Alī ibn Mūsā ibn Ja‘far (766-818 AD), known as Imam Reza, is the eight of the Shiite Twelve Imam, an extremely respected and holy figure for Shiite Muslims. 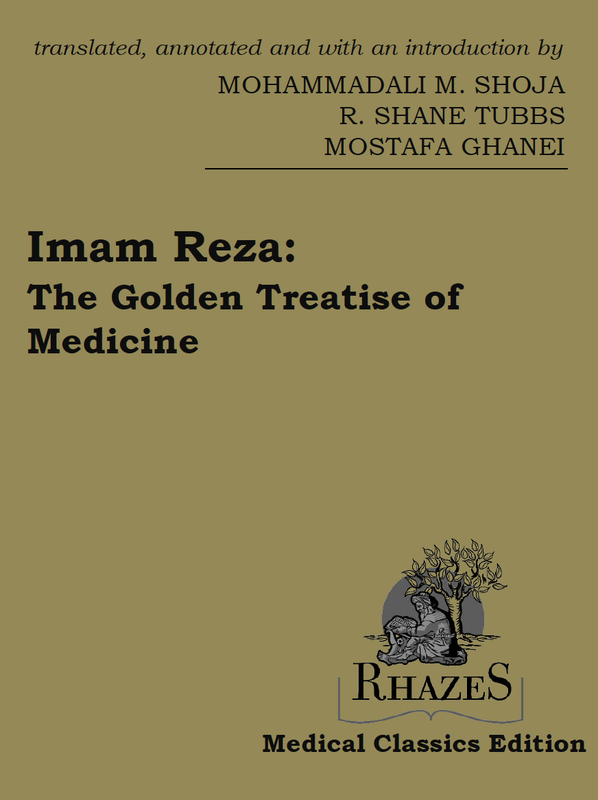 His medical epistle written to Abbasid Caliph al-Ma’moon was known as “The Golden Treatise of Medicine” (al-Risalat az-Zahabiyya), a classic Arabic medical text, has scarcely been examined in English literature. This book presents the first annotated English translation of this medical epistle, supplemented with a biography of the author and an explanatory introduction. Ibn Nafis (1213–1288) is known for his discovery of the pulmonary circulation long before Michael Servetus and William Harvey. Shedding light on the pulmonary circulation for the first time in the history of science, Ibn Nafis’ Commentary on the Anatomy in the Canon of Avicenna has been the subject of many studies, but these have all been limited to his notion on the circulation. It is equally important for the historians of science and medicine to scrutinize the remaining parts of this commentary, yet to be fully translated into English. This book is the first English translation of a section of Ibn Nafis’s commentary on the anatomy of the nerves and particularly, the cranial nerves. August Froriep (1849–1917) was a German anatomist at Tübingen and a student of the great Jacob Henle (1809–1885). Froriep is known for his studies on the morphology and embryology of the head and vertebrae, and his descriptions of the temporary aggregation of neurons at the root of the embryonic hypoglossal nerve, known today as Froriep’s ganglion. In 1882, Froriep and Henle’s former students gathered in Gottingen to commemorate the 50th anniversary of Henle’s doctorate and present him a gift, Beiträge zur Anatomie und Embryologie (Contributions to Anatomy and Embryology), a book composed of chapters written by his students. The book included the classic paper by Froriep on the development of the notochord, which contained six beautifully crafted illustrations of this developmental anatomy. The present book is the first English transla-tion of Froriep’s paper as it appeared in Contributions to Anatomy and Embryology as a Gift to Jacob Henle, On April 4, 1882, Presented by his Pupils. Froriep’s black-and-white illustrations of notochordal development are reproduced in color. Herniation of posterior cranial fossa contents was almost unknown before the publications of the Austrian pathologist Hans Chiari. Although other earlier, scattered, and single descriptions of the various types of hindbrain malformations that he studied had been made, it was Chiari who comprehensively described and categorized these pathological entities. This book presents the first English translation of Chiari's 1896 masterpiece on hindbrain herniations. The importance of these works in the history of medicine cannot be overstated. 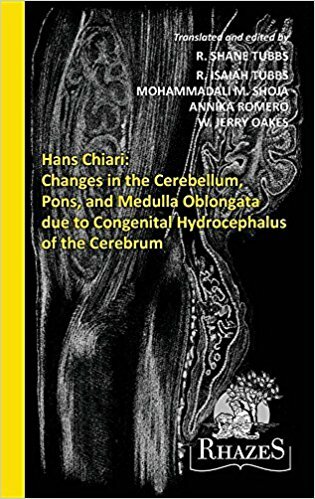 It is this monumental publication that would go on to pave the way for a better understanding and the development of surgical techniques to treat what has appropriately become known as the Chiari malformations. Gray’s Clinical Photographic Dissector of the Human Body, by Drs. Marios Loukas, Brion Benninger, and R. Shane Tubbs, helps you take a clinical approach to the study of anatomy. This unique dissection guide uses full-color photographs rather than anatomical drawings to orient you more quickly in the lab, and points out the clinical significance of each structure and every dissection you make. You will also find valuable information on several emergency procedures used today to further reinforce the clinical correlations. With 1,300+ photos, this resource is a great way to learn or review anatomy and its relevance to clinical practice. Easily relate anatomy structures to clinical conditions and procedures. Perform dissections with confidence by comparing the 1,350 full-color photographs to the cadavers you study. Understand the pertinent anatomy for 18 common emergency procedures such as lumbar puncture and knee aspiration. Depend on the same level of accuracy and thoroughness that have made Gray’s Anatomy the defining reference on this complex subject, thanks to the expertise of Dr. Marios Loukas, a leading authority in the world of clinical anatomy.